Your Halifax Public Libraries card gives you access to digital books, audiobooks, magazines, newspapers, movies, music, and much more. On our new site, finding it all is simple. Enter, our E-Library. To get started searching in our E-Library collection, click the E-Library tab on our website menu bar. Under this tab, you can browse our digital content by Read and Stream (format-based), Resources, or By Subject. You can also click View More... to see additional items under a category. You can also use the website's Search box to search our Website for any Online Resources related to your keywords. 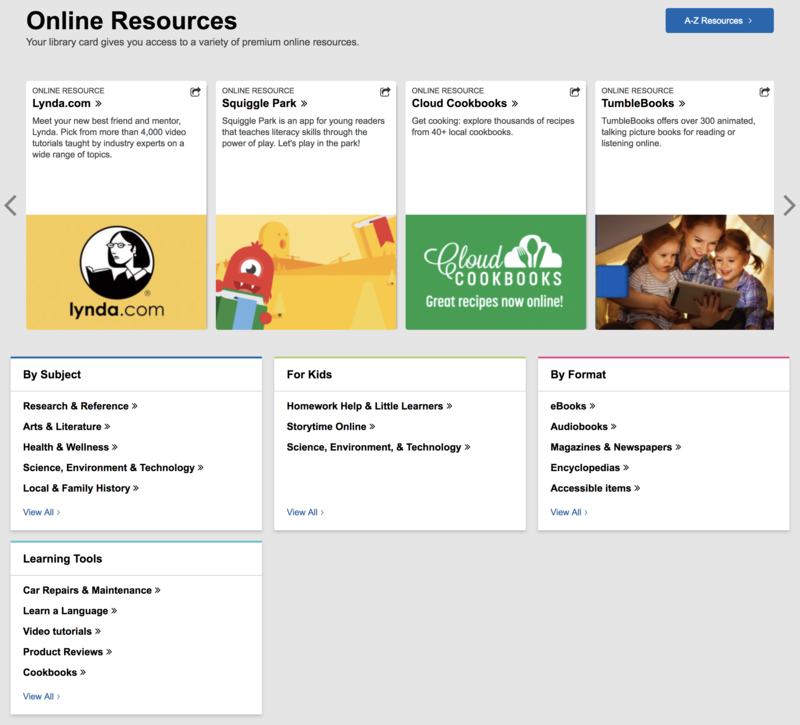 Once you've landed on an Online Resource, you'll read a quick blurb about it. Clicking the Resource title will take you to the external website where it is hosted. An example of an Online Resource record in our E-Library. Read and Stream, under the E-Library tab allows you to browse the collection based on format. Explore our E-Library’s e-book, magazines and newspapers, or movies and music collections. You can also browse our accessible items here. Example: If you select e-Books under this category, you'll be brought to a list of resources such as: OverDrive, TumbleBooks, Cloud Cookbooks, and more. The layout of our Online Resources page under E-Library. From researching your family history to learning a new language, we have digital content for everyone. You can browse such resources by selecting a Resource from the E-Library tab's list, or by clicking View More... to access more resources. You can also browse our A-Z list of resources by clicking the A-Z Resources button. Whether you’re searching for information about health and wellness or for news and current events, we’ve got you covered. For a complete list of subjects, click View More under the By Subject heading under the E-Library menu tab. We also highlight Online Resources on many special pages throughout our website. For example, when browsing our Business and Careers page, you might discover the Lynda.com resource highlighted at the top of the page and realize it's a perfect tool to help build your leadership skills. You're all set to go digital. Enjoy it all! Now that you're digitized, consider organizing your own digital collection, using the My Shelves feature. Learn how in our All About My Collections and My Shelves blog post.